I've received copies of My Very First AUDIO CD/book! Love what Scholastic US Book Clubs did for "Fox and Squirrel". Produced by Listen Inn. Read by Joy Arcolano. Belgium's Mijade "Chut, mon frère dort..."
Belgium's Mijade's beautiful edition of "Chut, mon frère dort...". Translation: Agnès de Ryckel. Swoon. Mijade has world rights, excluding North America for this French language edition of "Shh! My Brother's Napping"(Scholastic Canada). Love the beautiful front endpaper for this edition. "Shh! My Brother's Napping" (Scholastic Canada) has been translated into Spanish. Publisher: Picarona/Ediciones Obelisco S.L. in Spain. FOX AND SQUIRREL (Scholastic Canada) is a CBCbooks selection for "12 contemporary Canadian Picture Books every home should have". Honoured to have FOX AND SQUIRREL MAKE A FRIEND (Scholastic Canada) selected for Sarnia's first StoryWalk. THANK YOU Lambton County Library and Sarnia's Parks and Recreation Department. Someone else's book will get a chance to be featured in the Spring. Love the idea of combining physical and reading literacy! is a Grade One New York City READS365 Selection. "NYC Reads 365 challenges New Yorkers to read every single day." FOX AND SQUIRREL and FOX AND SQUIRREL MAKE A FRIEND (both Scholastic Canada) have been published in China by Henan Tianxing Education & Media. So excited to get my copies! Both books are now also available in French and Korean. I've been doodling for years during school visits and then with my own kids at home. "Scribble" is for all those awesome scribblers who colour outside the lines. 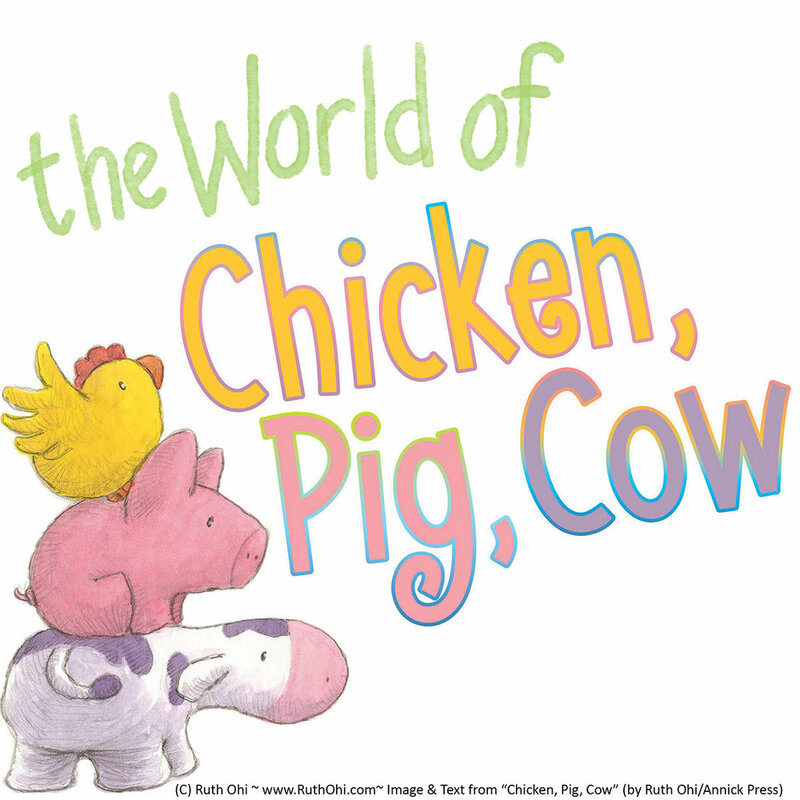 So honoured to have "Chicken, Pig, Cow" (Annick Press) selected for "100 BEST Canadian kids' books of all time". Honoured to have FOX AND SQUIRREL (Scholastic Canada) listed as a Saskatchewan Shining Willow Nominee 2015. "Colourful illustrations and simple prose together deliver a humorous and important message." Honoured that FOX AND SQUIRREL and RIKKI et ROUQUIN (both Scholastic Canada) were among the books selected for Prince Edward Island's Family Violence Prevention Week Program in February. Click here or photo for complete article. Books selected "...feature characters that face challenges but find a way to overcome them and collaborate. Young children’s feelings are articulated and resolved in a caring, peaceful manner. "(excerpt from Journal Pioneer February 24,2015) Thank you to Journal Pioneer for permission to use the photo. 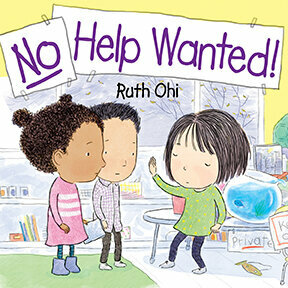 Ontario Library Association "Best Bets": "Shh! My Brother's Napping"
"Shh! My Brother's Napping"(Scholastic Canada) has been selected for the Ontario Library Association BEST BETS List. All six books in the series have been translated into Simplified Chinese for Mainland China. Beautiful embossing on the cover. Thick pages. The name 'Pig' is always printed in pink, 'Chicken' in yellow and 'Cow' in purple. Half endpapers for all. Publisher: Love Reading information Consultancy (Shenzen) Co. Ltd.
Toronto Public Library "First & Best": "Fox and Squirrel Make a Friend"
"Fox and Squirrel Make a Friend" is a Toronto Public Library "First & Best" Book. “The first books you share with your child should also be the best, and we’re excited to announce this expertly chosen list of books for parents and caregivers,” said Lisa Heggum, Children and Youth Advocate for Toronto Public Library. “Enjoying books with your child is the first step toward developing their love of reading and these positive, fun and playful stories are sure to help do just that, while also building their early literacy skills..."
"Fox and Squirrel" and "Fox and Squirrel Make a Friend" (both Scholastic Canada) are available in Korean. This is a special dot-coded edition that works with a reader pen to help kids learn the Korean language. "Fox and Squirrel"(Scholastic Canada) has been selected as a Marilyn Baillie Picture Book Award Nominee. Excited to have "Kenta and the Big Wave" (Annick Press) listed as a nominee for the2014 Caribbean's OneWorld Schoolhouse Foundation's Rainforest of Reading Award. Honoured to have "Kenta and the Big Wave" (Annick Press) listed as a nominee for Saskatchewan's 2014/15 Shining Willow Award.